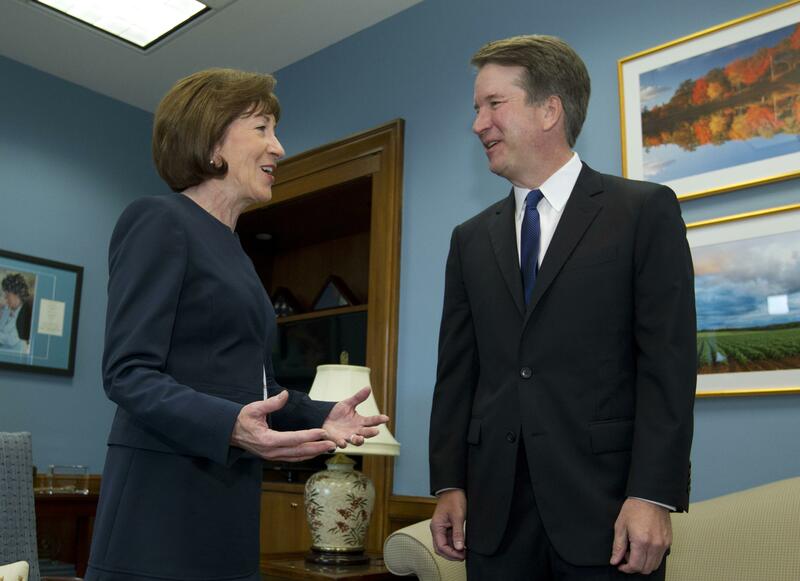 Sat., Sept. 8, 2018, 9:43 a.m.
PORTLAND, Maine – The end of contentious confirmation hearings for U.S. Supreme Court nominee Brett Kavanaugh has shifted the focus back to potential swing votes like Republican Sen. Susan Collins of Maine. In keeping with her deliberative approach, Collins has kept mum about how she’ll vote. Still, she’s sent signals that Kavanaugh cleared a hurdle by telling her that Roe v. Wade establishing abortion rights is settled law. A spokeswoman for Collins said a recently released email from Kavanaugh – in which he disputed that legal scholars generally see Roe as settled – didn’t change the senator’s mind about what he told her. It’s a similar story in Alaska. Murkowski, who also supports abortion rights, is reviewing Kavanaugh and won’t announce her vote before his nomination goes to the Senate floor. “Basically, she’s still vetting the new information that’s coming out,” said her spokeswoman, Hannah Ray. Collins, for her part, is following the same process she used with GOP nominees John Roberts, Samuel Alito and Neil Gorsuch, and Democratic nominees Sonia Sotomayor and Elena Kagan. “I have voted for Justice Sotomayor, and I’ve also voted for Justice Alito,” she said, referring to justices at the opposite ends of the ideological spectrum. “I respect the fact that one of my jobs is to determine whether or not the candidate is qualified for the court, has the requisite experience, and has the judicial temperament, as well as respect for precedence,” she added. While she’s never voted against a Supreme Court nominee, Collins has vowed to reject a candidate who’s hostile to the Roe v. Wade ruling. She said Kavanaugh told her during their face-to-face meeting that he views the 1973 decision as established legal precedent. In Durham, Mindy Woerter said she traveled to Washington to meet with Collins and tell her about an abortion she had because the fetus she was carrying had a fatal anomaly. Collins insists she’s still deciding. She said she was surprised when many groups reacted reflexively against Kavanaugh’s nomination, without due consideration. “I was shocked when many of my colleagues on both sides of the aisle took a position on the nominee before his identity was even known. That’s just extraordinary,” she said. Outside observers remember when all senators took a more deliberative approach. “There’s a lot to like in that kind of a process,” said University of Maine professor Mark Brewer. Collins, who’s not up for re-election until 2020, voted last month to preserve funding for Planned Parenthood a day after the same organization rallied in Washington to encourage her to vote against Kavanaugh. On Thursday, the group delivered letters to her office in Bangor. “I’ve learned not to expect a ‘thank you,’” Collins said. Published: Sept. 8, 2018, 9:43 a.m.